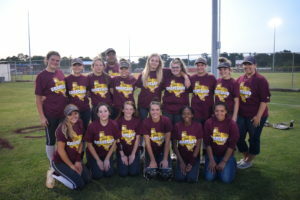 GRAPELAND – A year ago at this time, the Grapeland Sandiette softball team was struggling. The team had made the playoffs, but youth and inexperience took its toll as the Sandiettes were bounced from the playoffs in the first round. 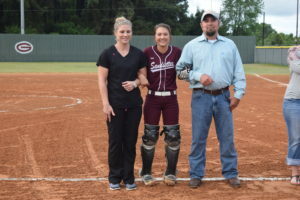 Fast forward a year and Grapeland has had a resurgence in its softball program. The team went from fourth place in the district standi ngs to being crowned as district champions. They sported a #16 ranking in the last regular season Texas Girls’ Coaches Association poll and seemed poised to make a deep playoff run. 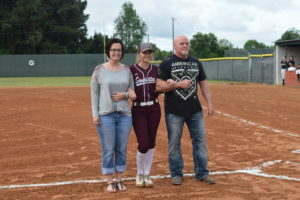 Unfortunately, the 2017 softball season came to a bitter end last Friday at the hands of the Alto Lady Jackets by a final score of 2-1. The Sandiette bats went quiet, mistakes in the field led to the two Alto runs and very questionable umpiring led to the Grapeland loss. While the 2016 season was a rebuilding year, the 2017 season saw the team overcome adversity and bond together as one. 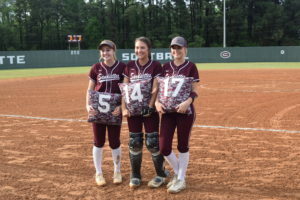 The Sandiette rejuvenation was due in large part to the team’s senior leadership coupled with a freshman phenom in the pitcher’s circle. 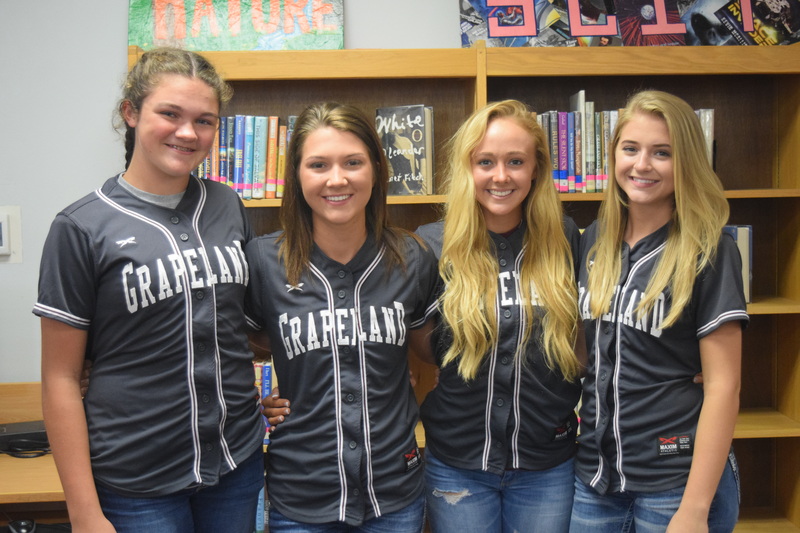 Before the Sandiettes began their playoff run, seniors Madison Holbrook, Taylar Mullen and Hailee Sheridan, along with freshman Cadie Belle Currie sat down with The Messenger to discuss how Grapeland softball seems to have returned as a force to be reckoned with in the future. One of the areas discussed was how decisions were often made as a team. “We don’t j ust go into a game and throw someone into a spot. Coach (Joel) Barbosa doesn’t just say he’s the coach and dictate the game. He asks for our opinion,” Mullen said. An important lesson learned over the course of the season occurred in the Sandiettes’ lone district loss to the Centerville Lady Tigers. During that game, Grapeland committed eight errors and lost by a score of 7-6. 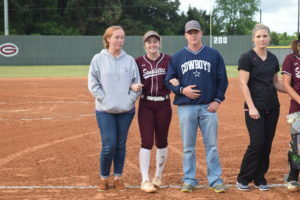 As the conversation continued, the subject turned towards the softball rivalry which has developed between the Slocum Lady Mustangs and the Grapeland Sandiettes. Grapeland swept the season series against Slocum, after the Lady Mustangs swept the Sandiettes in 2016. “Slocum has always been our rival. Every single year it’s been either us or Slocum, Slocum or us. I guess Slocum thought we weren’t going to be that good this year because of last year. There was a lot of smack talking back and forth but after the second game I was like who’s talking now?” Holbrook said with a smile. “It was like Madison earlier, we were down by five runs but nobody ever gave up. We all thought to ourselves, ‘This is Slocum. We will fight to the death,’ or literally be bleeding on the field before we let them beat us,” Mullen added. Currie said you could feel the tension in the air as the first game got underway. “They have always been our rivals and when I got in the circle, it seemed everybody was watching. It was nerve-racking,” the freshman pitcher said. It seems the rivalry will continue to thrive in the years to come. Slocum will lose one player from this year’s team while the Sandiettes will lose Holbrook, Mullen and Sheridan. Asked what her thoughts were in the first Slocum game, after Grapeland fell behind by five, Currie said she was worried she wasn’t doing the right thing. “I was trying to work out all the details in my head for the next pitch and then they hit that one, too. It stressed me out,” she said. 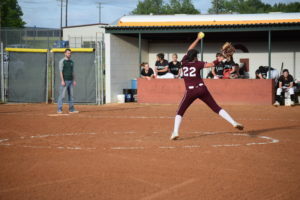 As the Sandiettes mounted their game one comeback against the Lady Mustangs, Currie said she realized she needed to stop overthinking and just pitch. Mullen said she felt the comeback against Slocum taught the freshman and sophomore Sandiettes an Important lesson. “I think they realized they are softball players just like everyone else out there on the field. I also think they realized when they are on their game they’re not mediocre,” she said. “I’m proud of our underclassmen. They don’t go into the game acting like freshman and sophomores. They act like us. If we’re nervous, they’re going to be nervous. If we’re chilled, they’re going to be chilled. If we work hard, they’re going to work hard,” Sheridan said. “They all reflect off of what we do. I don’t think Madi (McCombs), KeKe (Harris) or Haylee (Reed) will freak out in the spur of the moment. They are very mature,” she added. “W e’re hoping to pass that down next year when we’re not here. I hope they have that same type of vibe when they play and the incoming freshman are looking to them to be the team leaders,” Mullen said. “Last year, Coach Barbosa asked if anyone was going to step up and lead the team. This year, that wasn’t a problem. You might see us at practice where KeKe is struggling with something and Madi knows how to fix it. She’ll go up there and help her out. Or, KeKe might see something that Madi is struggling with and help her out,” she said. There were no juniors on this year’s team and only the three seniors. While it was a tough loss to the Lady Jackets, it appears the Sandiette softball team has re-established itself as force to deal with in the years to come. Previous articleElite Fitness Brings Home the Gold!